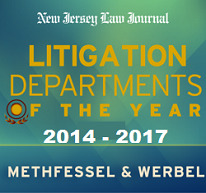 Ed was selected as a Super Lawyer in the State of N.J. in 2005, representing a wide range of practice areas, firm sizes and geographic locations through peer recognition and professional achievement. According to the publication of N.J. Monthly in conjunction with Law and Politics, only the top five percent of the lawyers in the state are named Super Lawyers. The nominees are grouped into practice areas. Those nominees with the highest point totals from each practice area are invited to serve on a blue ribbon panel to select nominees from their own practice area. The top 5 % of candidates from each group are selected as Super Lawyers. Mr. Thornton initially worked for the firm of Robert J. Casulli, Esq., as staff counsel for Allstate Insurance Company where he handled the defense of liability cases. Since joining Methfessel & Werbel in 1978 Mr. Thornton has handled liability defense trials and appeals on behalf of insurance companies. He specializes in catastrophic injury, legal malpractice as well as dental and medical malpractice cases, and the defense of lead poisoning and product liability matters. He has spoken at lead poisoning and toxic mold seminars and automobile insurance reform seminars. He is a member of the Hudson County Bar Foundation, the Union County Bar Association and the Defense Research Institute. He is a court appointed arbitrator of personal injury, automobile, and product liability matters and appointed as arbitrator by the American Arbitration Association. He is also certified by the New Jersey Supreme Court as a civil trial attorney and admitted to practice before the United States Supreme Court.